Kiskiack Golf Club became the first golf course in Virginia to go solar in May 2018. (L to R): Solar United Neighbors of Virginia Program Director Aaron Sutch, Kiskiack owner Carl Zangardi, William & Mary’s Henry R. Broaddus, and Chad Wilkins from Convert Solar. 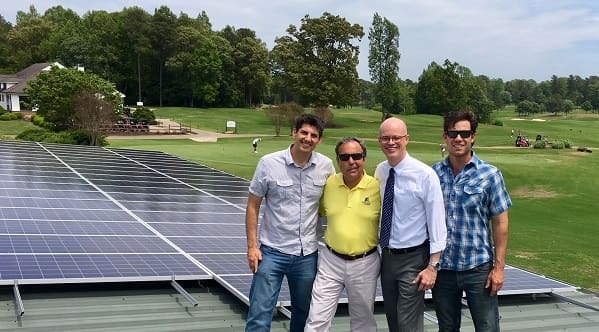 Last week, Kiskiack Golf Club in Williamsburg became the first golf course in Virginia to install solar panels. The 29 kW solar system installation, consisting of 88 panels, was completed by Convert Solar as part of the Hampton Roads Solar Co-op, a community bulk purchase program supported by Solar United Neighbors of Virginia. The system installed on the roof of the golf club’s maintenance building will offset up to 25% of the energy used by the golf course and save more than $3,000 on electric bills each year. Due to the co-op discount, the system is expected to pay back in 7 years while the panels expected to continue generating energy for the next 30 years. Kiskiack celebrated the installation with a public event on Tuesday, May 15 that featured brief remarks from Solar United Neighbors of Virginia Program Director Aaron Sutch, Kiskiack owner Carl Zangardi, William & Mary’s Henry R. Broaddus, and Chad Wilkins from Convert Solar, the installer selected to service the group. They discussed the benefits of going solar, the Solar United Neighbors solar co-op process, and why solar power is a good fit for Kiskiack. The Hampton Roads Solar Co-op is open to Virginia neighbors and businesses from Williamsburg to Newport News and Virginia Beach. The group currently has 52 members and is open to new participants interested in getting a personalized quote from Convert Solar at the discounted group rate through the signup deadline on June 8. The group is hosting an upcoming free public information session for all interested community members on Wednesday, May 30 at 6:30 PM in the Brock Center (3663 Marlin Bay Dr, Virginia Beach, VA 23455). RSVP today to learn more about solar energy and how the Hampton Roads Solar Co-op can help you get a great deal on a quality system installation!